Welcome to all of my new followers. I know that I’ve gotten tons of hits from a few of my pins on Pinterest, so I’m thrilled that once you visited, you decided to subscribe. Thank you. I haven’t posted anything new in quite some time because I haven’t had the motivation (a) to cook or (b) to stick to low-carb when I did. One of the problems in dealing with depression is the difficulty in managing household tasks. And that means that it makes it really difficult to motivate myself to clean up after cooking, which means I either have a filthy kitchen or I don’t cook. I choose the cleaner route. The other problem in dealing with depression is that when I’m not eating healthfully, my depression worsens. So it’s a double-edged sword. However, now that the gorgeousness that is fall weather has arrived, there’s been a lifting of my mood, which means more motivation to do more, both inside and outside of the house—which also means COOKING! I’ve still been collecting low-carb recipes I want to try, so hopefully from now on, I’ll have at least two or three new ones that I’ve tried out to post each week. So let’s get started, shall we? Gather and measure all ingredients and tools before starting prep. Put oil in skillet and place on stove over medium-high heat. While that is heating, cut off end of bok choy and cut into 1.5- to 2-inch pieces (smaller at the thicker part at the bottom, larger as you get toward the crown), and cut the green leafy part into ribbons. Set aside. Once oil is hot and glistening in the skillet, add garlic, ginger, and red pepper flakes. Cook, stirring constantly, until fragrant but not browned, about 30 seconds. 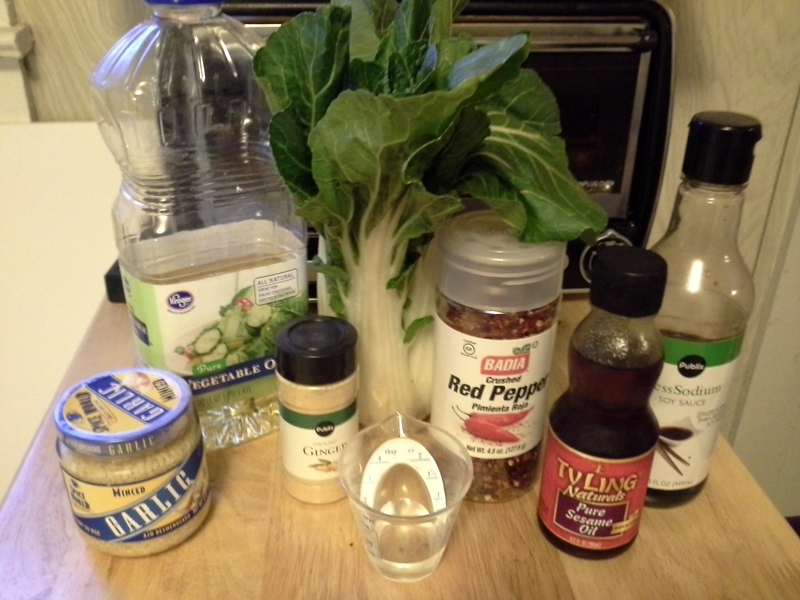 Add bok choy (be careful—any water remaining on them will pop in the oil) and stir to coat with the oil. Cook, stirring, about 1 minute. Add soy sauce and water then cover and cook/steam about 1 minute. Uncover and continue cooking about 2 minutes, or until most of the liquid has cooked off and thickest pieces are crisp-tender. Remove from heat and add sesame oil, stirring to combine. Season with salt, if needed. 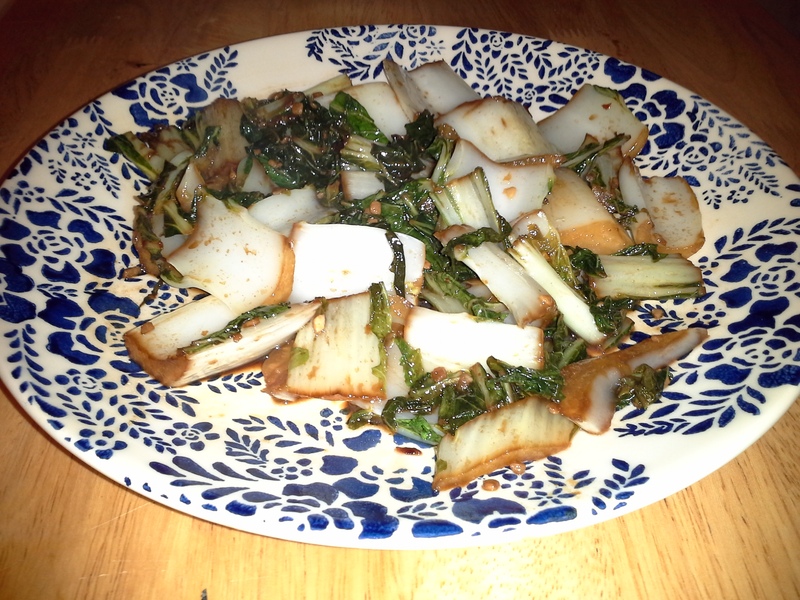 This was my first time working with/eating bok choy. While it’s easy enough to prepare, I can’t say I’m a fan—it’s a little too bitter for me. I may try this with either Napa or regular green cabbage, though. And a splash of acid—a twist of lemon or lime juice—probably wouldn’t go awry with this either. It was good on its own, but it was fabulous with the sauce from the coconut-curry shrimp I also made. Stay tuned for that recipe tomorrow! Looks lovely! I might serve this with some cauliflower rice and a chicken thigh. Happy days! HUGS to you during this difficult time. I have never fully experienced depression but I have been around loved ones who have. Thanks for the recipe! Thanks, Tracy! It’s something I’ve been fighting most of my life, and usually I’ve been able to come back from it on my own, and within only a few months. This time, it’s been a few years—starting three or four years ago when I was unemployed and struggling to both try to make ends meet and find a job. Well, now I have a great job that I enjoy, but I’m just not bouncing back the way I’d hoped (though I was able to come off the medication about 18 months ago). And I know a huge part of that is the fact that I’ve regained all the weight I’d lost before getting laid off from my previous job (plus about 20-30 pounds, putting me at my highest weight ever) and I don’t eat well. Which means that I feel physically bad/slow/lethargic in addition to mentally/emotionally. I’m hoping that committing myself to at least three new recipes a week for this blog will be some of the motivation I need to get back on track. And getting out and walking through the neighborhood in the afternoons, now that the weather is nice, should help too.